President Trump loves to brag about the stock market's incredible post-election run. He'd surely hate to see it come to an end. One way to prevent the market from getting knocked off course is to keep one of its biggest backers in place: Janet Yellen. The Federal Reserve chief's promise not to remove the easy-money punch bowl too quickly has helped keep the party on Wall Street going. If Trump replaces Yellen when her term expires in February, he risks unnerving investors who've become hooked on low rates. "Removing her at this juncture may be a mistake, and it's possible the president understands this," Michael Block, chief market strategist at Rhino Trading Partners, wrote in a report on Tuesday. 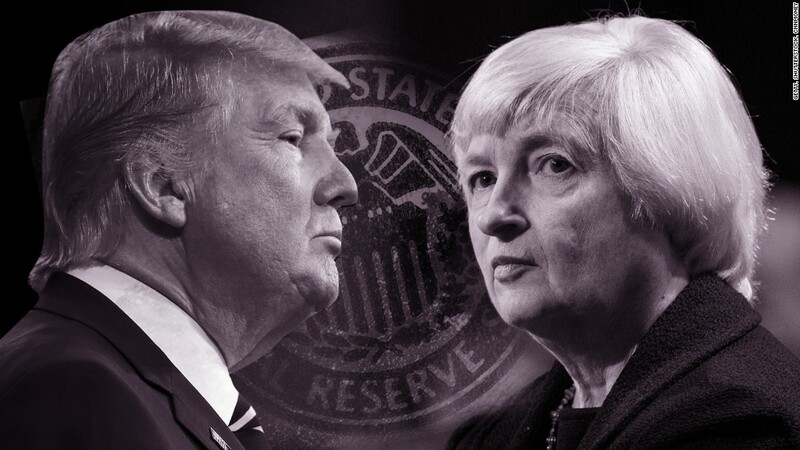 After interviewing four other candidates, Trump plans to meet with Yellen this week, sources familiar with the session told CNN. Assuming she wants the job, this may give Yellen the advantage of being the last candidate to make an impression on Trump. "Yellen represents continuity in an unstable world," said Isaac Boltansky, senior policy analyst at Compass Point Research & Trading. "Her renomination would be a welcome development for the market." Trump has had a bit of a love-hate relationship with Yellen. As a candidate, Trump said Yellen should be "ashamed of herself" for creating a "false stock market." Since taking office, Trump has softened his stance, saying Yellen is doing a "good job." While Trump's instinct to make unconventional picks may steer him away from Yellen, there are plenty of reasons beyond the stock market that it would make sense for him to keep her at the helm of the Fed. Yellen has a reputation for preferring to keep interest rates low. That "dovish" stance lowers the odds that the Fed unintentionally disrupts the economic recovery through rapid interest rate hikes that cause borrowing costs to go up. Trump realizes this. "I'd like to see rates stay low. She's historically been a low-interest-rate person," Trump told The Wall Street Journal in July about Yellen. Some of Trump's other top choices may be in more of a rush to hike rates out of understandable concern that easy money is fanning inflation and asset bubbles. Former Fed governor Kevin Warsh and Stanford economist John Taylor, both of whom Trump has interviewed, are considered "hawks," especially compared with Yellen. Yellen could help Trump's economic agenda. Trump, who gave himself the "King of Debt" nickname last year, has proposed a potentially expensive tax overhaul. The Tax Policy Center estimates the GOP tax framework would slash federal revenue by $2.4 trillion over 10 years and $3.2 trillion over the second decade. Trump has also talked about borrowing more money to repair the country's crumbling infrastructure and ramp up defense spending. The bond market hasn't freaked out about Trump's borrowing plans in part because the Fed has kept interest rates very low. But a more hawkish Fed chief could change the calculus about America's $20 trillion and counting in debt. Trump has blasted Democrats as "obstructionists" who keep blocking his nominations to vital government posts. But Yellen, who was appointed by President Obama, would likely encounter little resistance. Of course, Trump may not wish to keep Yellen precisely because Obama picked her. And Trump voters who wanted him to topple the establishment may not love it either. At first glance, Yellen doesn't seem like a good candidate for Trump because she has defended Dodd-Frank, the financial reform law the president has trashed. But Trump already has a point person on regulation at the Fed: Randy Quarles, who was recently confirmed by the Senate. Besides, Trump would likely applaud Yellen's recent regulatory actions. Earlier this month, Yellen voted in favor of removing the "too big to fail" label from insurance giant AIG (AIG). Yellen also put her clout behind a recent move by regulators to ease capital requirements on community banks and other lenders. In a recent speech, Yellen noted that community banks didn't start the financial crisis -- and shouldn't be saddled with "unduly burdensome" regulation. By design, it's difficult to predict major Trump decisions like this one. But it's not hard to see why he's still looking at Yellen. "Nominating Yellen again would be a win for both Trump and the markets," said Boltansky. -- CNN's Kevin Liptak contributed to this report.